Doesn't Everybody like CHOCOLATE?... socks? 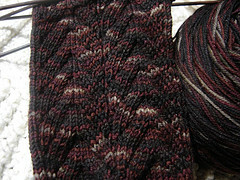 Making progress on my new socks... the photos don't reflect it, but Im past the heel on both Socks now! I decided I should work in Tandem so that I could make the cuffs as long as possible. I don't know why, but I find it freezing cold at work this winter, and my homemade sock collection seems to be making a difference, so the longer the better. 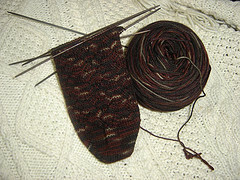 The pattern I chose is This one - Salis Socks by Julia Riede, that I found on Ravelry as a free download. 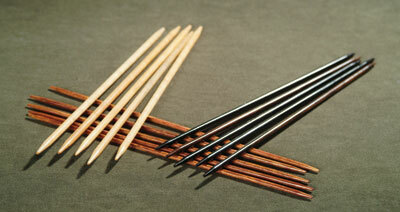 I was ticked off thinking that I had just broken 2 five-dollar toothpicks, but I called Lantern Moon, who very impressively - Stand by their products! they said they would send me out a replacement for the broken ones. Now I'm not sure if they will send a whole set, or it there will be just replacements for the 2 I broke... but either way, I was very excited that I would be able to salvage the set I have, especially since you can't buy them around here. Now that's telephone customer service! Work has been quite overwhelming lately, so I will gladly go home tonight, hit the couch, maybe even turn on the fireplace, and knit until I'm ready to fall asleep. Excellent way to zone out after a hard day. Isn't Christmas fun? and New Years? and isn't all the holiday hubbub exhausting? As much as I hate to admit it, its nice to be back to a regular routine again... Some people find January cold and dark and boring, but I think this year, that means perfect circumstances for me to stay in, get cozy, and stay comfy on the couch. This year's homemade Christmas gifts went over well enough that I think I will try and get a move on early, and finish up a few presents that I can give away next year to some of the more difficult to buy for family members. Yarn is ordered, patterns chosen. Maybe I'll stay organized this year? who knows. On the Knitting frontier... I finally got around to testing out those Lantern Moon Double Pointed Needles I bought when I was on Vacation in Las Vegas back in November. I'm not exactly sure why it took me so long to whip them out, but quite an unexpected change from the boring old steel needles from Walmart that I have been accustomed to. 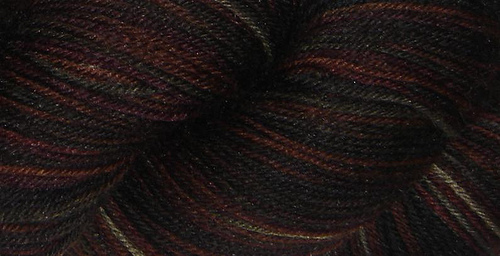 Specifically, I am using size US 0 / 2 mm Ebony Double Pointed 6 inch needles (you can see all of Lantern Moon's products here) paired up with the Chocolatey Brown Cascade Heritage Sock yarn I also bought while I was away. First Impression: Wow these things are bendy compared to steel needles! In fact I was a little afraid at first that I would break them, because they felt so malleable in my hands. Think of skewering firm vegetables for kabobs in the summertime... those skewers feel pretty weak, but are actually stronger than they feel. After knitting a few rows, I think I learned to hold them a little bit differently, because the initial fear of toothpick-snapping passed. So once I got over the basic fear of breaking essentially a 5$ toothpick (a set of 5 DPN's retails for a little over 22$USD compared with the same sized steel needles from a department store retailling at around 3-5 $ a set) I think I am really going to enjoy the switch.. though affording a set of every size may take some saving up. At this point, I have a set or two of virtually every size in Steel collected! The only real issue I see with the Lantern Moon Needles is the durability of the product for the cost. There are no retaillers in my direct area that sell this product, so I am limited to local purchases of steel or bamboo needles, or mail ordering or buying on the internet, and snail mail is definetly too slow if you want to start a new project this upcoming weekend. Final Rating - 2 Thumbs Up! Anyhoo! That's the scoop for today! Being at work at the Hospital all weekend has made me crave an evening of TV watching and spinning/knitting, which I will be heading off to do really really soon. 1 hour to go!